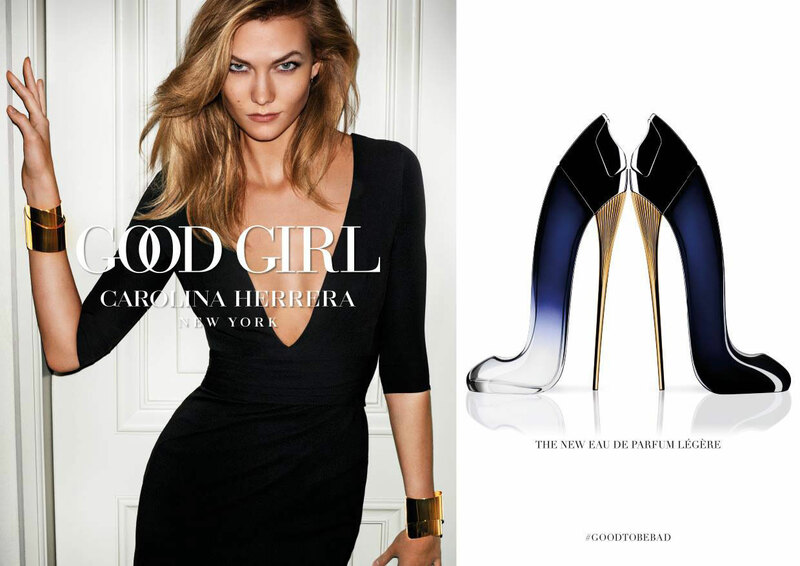 Good Girl Legere by Carolina Herrera - This lighter version of the original Good Girl floriental fragrance, also created by perfumer Louis Turner, includes the note of ylang-ylang and dulce de leche, in a blend of jasmine, tuberose, sandalwood, and roasted tonka bean. The scent is toned down with a lighter dose of tuberose and the exclusion of the coffee note found in the 2016 original. The new Eau de Parfum Légère scent is housed in the same stiletto perfume bottle with a deep blue to clear glass fade and gold accents. Launched in February 2018, this latest version is available in an eau de parfum spray and matching body lotion from ULTA, Nordstrom, and Macy's. The fragrance campaign ads features model Karlie Kloss photographed by Mario Testino. Package Design Original Good Girl perfume bottle stiletto bottle in deep blue to clear glass with gold accents. "GOOD GIRL EDP Legere is a fresher, bold evolution of the iconic GOOD GIRL fragrance. A glamorous symbol of empowerment, GOOD GIRL EDP Légère embraces your good side - and bad - in a luminous, sophisticated fragrance. "FROM DAY TO NIGHT IN A GOOD GIRL'S SHOES - The iconic symbol of a 'femme fatale' has been reimagined, keeping the haute-couture gold stiletto heel from GOOD GIRL and empowering it with a new equally seductive personality. The black-lacquered bottle gradates from a clear, transparent base to a midnight-blue crown, representing the transition from Day to Night - and from Good to Bad. "WHY CHOOSE ONE ROLE, WHEN YOU CAN PLAY THEM ALL? - Representing strong women and their 'alegría de vivir' GOOD GIRL EDP Légère reinterprets the essence of the modern femme fatale. Lighter and softer than the original scent, GOOD GIRL EDP Legere uses the regal Jasmine Sambac Imperial; a soft flower known for its exquisite high quality. A more sophisticated Tonka is enveloped by creamy woods and the sensual, velvety aroma of Dulce de Leche. "IN THE RIGHT SHOE, A GIRL CAN CONQUER THE WORLD - This new ultra-feminine GOOD GIRL is more subtle but equally captivating, channelling her good and bad side with daring sophistication - and to devastating effect. Her inner confidence is radiant, empowering others with her fearless approach. The world is hers, and now she has the right shoes to conquer it."